Synthetic peptide conjugated to KLH derived from within residues 300 to the C-terminus of Human HEXIM1. Recombinant Human HEXIM1 protein (ab117163) can be used as a positive control in WB. This antibody gave positive signal in the following, human Whole Cell Lysates: HeLa, Jurkat, A431, HEK293 (Data not shown), MCF7, SHSY-5Y Mouse Whole Cell Lysate: MEF1, NIH 3T3 (Data not shown); Mouse Tissue Lysates (Data not shown): Kidney,Testis , Ovary ; Rat Tissue Lysate (Data not shown): Kidney This antibody gave a positive signal in the following Methanol/Formaldehyde fixed cell line: HeLa. Our Abpromise guarantee covers the use of ab25388 in the following tested applications. WB Use a concentration of 1 µg/ml. Detects a band of approximately 54 kDa (predicted molecular weight: 41 kDa). Abcam recommends using milk (3%) as the blocking agent. ab25388 recognizes a band at approximately 54 kDa that corresponds in size to that seen for HEXIM1. Although it has a predicted molecular weight of 41 kDa, it has been shown to migrate at a larger size of about 54-60 kDa (see Byers et al., J Biol Chem. 2005 Apr 22;280(16):16360-7 and Schulte et al., J. Biol. Chem., Vol. 280, (26): 24968-24977). HEXIM1 - ChIP Grade was immunoprecipitated using 0.5mg Jurkat whole cell extract, 5µg of Rabbit polyclonal to HEXIM1 and 50µl of protein G magnetic beads (+). No antibody was added to the control (-). 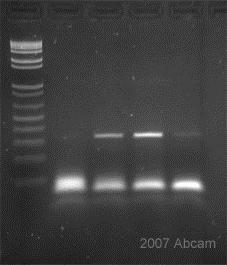 Proteins were eluted by addition of 40µl SDS loading buffer and incubated for 10min at 70oC; 10µl of each sample was separated on a SDS PAGE gel, transferred to a nitrocellulose membrane, blocked with 5% BSA and probed with ab25388. ab25388 staining HEXIM1 in human kidney. Paraffin embedded human kidney tissue was incubated with ab25388 (1/100 dilution) for 30 mins at room temperature. Antigen retrieval was performed by heat induction in citrate buffer pH 6.
ab25388 was tested in a tissue microarray (TMA) containing a wide range of normal and cancer tissues as well as a cell microarray consisting of a range of commonly used, well characterised human cell lines. ICC/IF image of ab25388 stained HeLa cells. The cells were 4% formaldehyde fixed (10 min) and then incubated in 1%BSA / 10% normal goat serum / 0.3M glycine in 0.1% PBS-Tween for 1h to permeabilise the cells and block non-specific protein-protein interactions. The cells were then incubated with the antibody ab25388 at 1µg/ml overnight at +4°C. The secondary antibody (green) was DyLight® 488 goat anti- rabbit (ab96899) IgG (H+L) used at a 1/1000 dilution for 1h. Alexa Fluor® 594 WGA was used to label plasma membranes (red) at a 1/200 dilution for 1h. DAPI was used to stain the cell nuclei (blue) at a concentration of 1.43µM. Publishing research using ab25388? Please let us know so that we can cite the reference in this datasheet.